When you download Bitdefender (Free edition), you can use anonymously for 30 days. After that, you need to login to Bitdefender: there is no limit to the number of computers or devices you protect, but signing in is required to keep getting the anti-virus protection. (Creating an account takes under a minute, and is also free.) Once you've logged in, Bitdefender -the company- keeps track of PCs and Macs in your account, and you can view that information online. 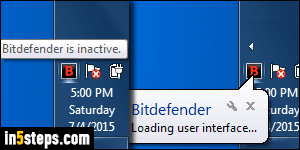 To open the control panel, click on the Bitdefender icon in the taskbar. If you don't see it, click on the up arrow button that reveals hidden icons. For security software, which uses its icon to communicate with you, I strongly suggest that you make its icon always visible in the system tray (notification area). 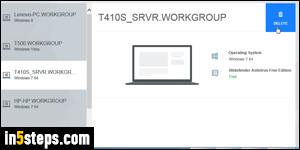 In the taskbar popup, click on the Display button - as shown on the screenshot. 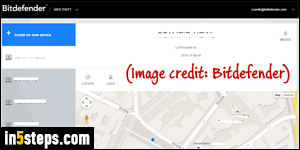 This will open a web page in your default web browser: under My Devices, you'll see the number of active devices currently stored under your account. By default, and particularly with the free version, none will be remote-managed. 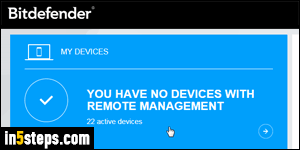 The "Remote Management" feature, for the business / enterprise version, lets you remotely deploy Bitdefender on company computers, for example. Click on My Devices to view the PCs and Macs associated with your account. If you've sold or lost a computer, it's best to dissociate your Bitdefender account from that particular machine. To do that, find and select it in the list on the left. Then, click on the Delete button (top right). This will not remove Bitdefender from that machine: it will only log it out, and remove it from your account. 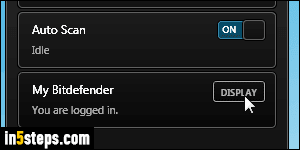 While you're in your Bitdefender dashboard, here's a feature you should consider using: Anti-Theft. It's an additional piece of software, also made by Bitdefender, that you install on your computer. Once installed, it allows you to remote-wipe that particular device in case it gets stolen. You will not be able to access that feature unless you have downloaded and installed it. To get it (it's free), click on the menu at the top -see screenshot- and select Anti-Theft. Once you've installed anti-theft on your computer, it works much like Find my iPhone for Apple iOS devices. Log into your dashboard, as we've done above, and locate the computer in question. From that screen, you can pinpoint is current location on a map, remotely lock it, or completely wipe its hard drive!